Project5 Photocut Processor is a bitmap tracer (raster to vector conversion program) that produces realistic photographic effect in vinyl decals using vinyl cutter only. You can overcome vinyl graphics limitations and produce any continuous tone image (photograph, landscape, etc.) with no additional costs. 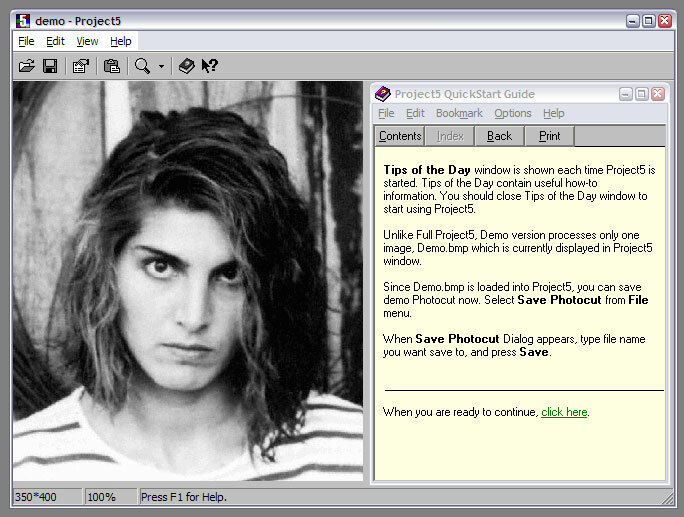 Project5 is easy to use and has a very short learning curve. It utilizes Install-and-Go(tm) technology to minimize time between installation and the first result. Useful help and hints will help you at each step of Photocut creation. Project5 integrates with major part of drawing and sign software. Project5 is the fastest application in its class. It's ready to produce up to 160 square feet of bitmaps per hour and is suitable for large sign shops. Project5 contains code and interface elements that are needed to produce Photocuts only. You don't need to pay for features you never use. Unlike other signmaking programs, Project5 produces realistic pictures. It was developed with the help of sign makers and especially for sign makers. Project5 is available to purchase via RegNow. Prices include free shipping worldwide! Widen horizons of vinyl signmaking with Project5! Photocut Processor creates vector data from bitmap data. This special kind of bitmap tracing (or vectorization) creates vector that looks like photograph. This vector is sent to a standard vinyl cutter, and applied on a surface like any vinyl sign (vinyl decal or vinyl letter). Another Project5 features include, but not limited to: Internet graphic support; Picture Preview in Open Picture Dialog; Drag-and-drop from Windows and Internet Explorer; Pasting from drawing programs (such as CorelDRAW); Pasting from graphic editors; Image editing from Project5; On-Line Help system; Tips of the Day; Quick Start Guide; Interactive Video Tutorial; The Five Steps to Photocut Wizard; CorelDRAW Plug-In; Integrating with CorelDRAW Guide; Process Priority Boost; Zoom In and Zoom Out; Electronic User's Manual. This site does not contain serial number, crack, keygen Project5 Photocut Processor serial number : serial number is the simplest type of crack. A serial number(cdkey,product key,etc) is register the program as you may already know. a crack or keygen may contain harmful software. If you cannot find the exact version you want, just give it a try. for more information read .nfo/.txt/.diz file include in zipped file.